In an ironic twist to Apple's ongoing worldwide legal battles, a German patent court on Thursday invalidated an Apple property asserted against Google and Samsung because a video of Steve Jobs presenting the feature onstage predates the filing, and is thus considered prior art in the country. Late Apple cofounder Steve Jobs presenting the original iPhone in 2007. According to court reports from FOSS Patents' Florian Mueller, the Bundespatentgericht, or Federal Patent Court of Germany, declared Apple's EP2059868 patent for a "Portable electronic device for photo management," covering a specific utilization of Apple's "bounce-back" user interface effect, invalid due to prior art. That prior art came from Apple cofounder Steve Jobs, who demonstrated the technology described in the patent during a 2007 keynote where the first generation iPhone was officially unveiled. At the time of the presentation, U.S. patent law allowed inventors a 12-month grace period in which to file a patent document after coming up with a novel idea. During this time period, nothing publicly shown or published could be considered prior art. 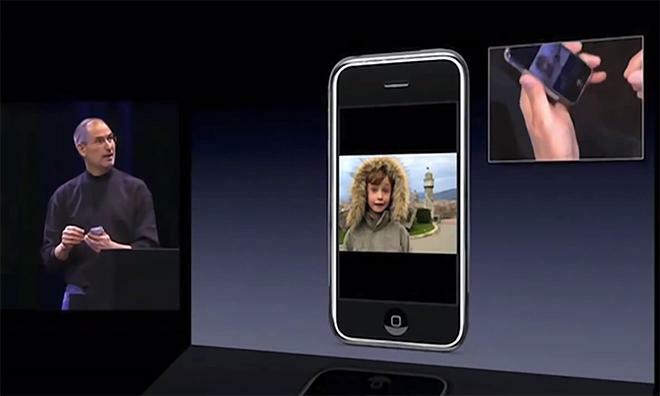 This mechanism does not exist in Europe, meaning the January 2007 video is considered a pre-filing disclosure and therefore technically prior art when weighed against Apple's late June patent priority date. In April, Google's counsel submitted the clip that shows Jobs demonstrating the iPhone's photo management feature. Apple attempted to enter amendments to show the European patent was colorably different from the tech being shown off onstage, but the court rejected the claims. Apple can appeal the decision if it so chooses. Mueller said that a member of Presiding Judge Vivian Sredl's panel opened Thursday's proceedings by outlining the court's inclination to invalidate the narrowed bounce-back patent based on two cases of prior art. One is a content display property that belongs to AOL/Luigi Lira called "Lira," while the other is a Microsoft-sponsored study called "LaunchTile." Although Apple's patent was invalidated, the company's counsel successfully argued novelty in light of both "Lira" and "LaunchTile," a win that Mueller said is significant in the grand scheme of the company's worldwide patent row due to an awarded German utility model covering the same photo bounce-back invention. Unlike European patents, German utility models do have a grace period of six months, meaning the Jobs video plays no role in its validity. This property was also asserted against Samsung in a different case previously stayed by the Mannheim Regional Court. In response to that particular claim, the South Korean company initiated revocation proceedings with the German Patent Office, but the body has yet to rule on the challenge. Apple could use Thursday's outcome, specifically the finding that "Lira" and "LaunchTile" don't invalidate the European photo bounce-back patent, to its advantage in the utility model proceedings. The company can ultimately request the Mannheim court to restart the claim against Samsung and even possibly use that property against other companies until it expires in 2017. How much $AAPL has Apple eaten with its $44 billion buyback appetite?